Crates may be plastic, often called flight kennels, or collapsible, metal pens. Collapsible fabric kennels are designed for use when the owner is present and may not contain a dog for long periods while unsupervised. Crates come in different sizes and can be purchased at most pet supply stores. Your dog’s crate should be large enough for him to stand up, lie down and turn around. Completely crate training your new dog may take days or weeks, depending upon your dog’s age, temperament and past experiences. If your new dog is not yet ready for the crate, he should be contained in a safe room that is easy to clean. Chewable or breakable items as well as electrical cords should be out of reach. You may use a baby gate or keep the dog connected to you on a leash. Your supervision is critical and when the dog is loose in the house, never let him out of sight. The steps, begin as soon as your new dog arrives home with you. To encourage your dog to enter the crate, drop small high-value food treats like small pieces of hotdogs or cheese near it, then just inside the door and finally, all the way inside the crate. If he refuses to go all the way in at first, that’s okay, don’t force him to enter. Continue tossing treats into the crate until your dog will walk calmly all the way into the crate to get the food. If he isn’t interested in treats, try tossing a favorite toy in the crate. Repeat these two exercises about five times. Make sure to praise the dog gently while he or she is in the crate and then take a short break. Repeat this procedure several times the first day. While introducing your dog to the crate, begin feeding him his regular meals near the crate. This will create a pleasant association with the crate. If your dog is reluctant to enter the crate, put the dish only as far inside as he will readily go without becoming fearful or anxious. Each time you feed him, place the dish a little further back in the crate. If your dog is readily entering the crate when you begin Step 2, put the food dish all the way at the back of the crate. After your dog is eating his regular meals in the crate with no sign of fear or anxiety, you can confine him there for short time periods while you’re home. Call him over to the crate and give him a treat. 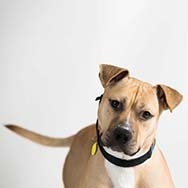 Give him a cue to enter, such as, “kennel up.” Encourage him by pointing to the inside of the crate with a treat in your hand. After your dog enters the crate, praise him, give him the treat and close the door. Sit quietly near the crate for five to 10 minutes and then go into another room for a few minutes. Return, sit quietly again for a short time, then let him out of the crate. Repeat this process several times a day. With each repetition, gradually increase the length of time you leave him in the crate and the length of time you’re out of his sight. Once your dog will stay quietly in the crate for about 30 minutes with you out of sight the majority of the time, you can begin leaving him crated when you’re gone for short time periods and/or letting him sleep there at night. After your dog is spending about 30 minutes in the crate without becoming anxious or afraid, you can begin leaving him crated for short periods when you leave the house. Put him in the crate using your regular cue and a treat. You will also want to leave him with a few safe toys in the crate. Stuffed Kongs give him something to do while you are away. Then leave quietly. You’ll want to vary at what point in your “getting ready to leave” routine you put your dog in the crate. You can crate him anywhere from five to 20 minutes prior to leaving. Don’t make your departures emotional and prolonged. When you return home, don’t reward your dog for excited behavior by responding to him in an excited, enthusiastic way. Keep arrivals low key. Continue to crate your dog for short periods from time to time when you’re home so he doesn’t associate crating with being left alone. Put your dog in the crate using your regular cue and a treat. Initially, it may be a good idea to put the crate in your bedroom or nearby in a hallway, especially if you have a puppy. Puppies often need to go outside to eliminate during the night and you’ll want to be able to hear your puppy when he whines to be let outside. Older dogs, too, should initially be kept nearby so that crating doesn’t become associated with social isolation. Once your dog is sleeping comfortably through the night with his crate near you, you can begin to gradually move it to the location you prefer. A crate isn’t a magical solution. If not used correctly, a dog can feel trapped and frustrated. For example, if your dog is crated all day while you’re at work and then crated again all night, he’s spending too much time in too small a space. Other arrangements should be made to accommodate his physical and emotional needs. It is not recommended to crate a puppy under 6 months old for more than 3-4 hours at a time. They can’t control their bladders and bowels for longer periods. Do not be surprised if the puppy has accidents in the crate, if left for longer than 3-4 hours at a time. If your dog whines while in the crate at night, it may be difficult to decide whether h e’s whining to be let out of the crate, or whether he needs to be let outside to eliminate. Try to ignore the whining. If your dog is testing you, he’ll stop whining soon. Yelling at him or pounding on the crate will only make things worse. If the whining continues after you’ve ignored him for several minutes, use the phrase he associates with going outside to eliminate. If he responds and becomes excited, take him outside. This should be a trip with a purpose, not play time. If you’re sure that your dog doesn’t need to eliminate, do not acknowledge the whining, otherwise you’ll teach your dog to whine loud and long to get what he wants. If the problem becomes unmanageable, you may need to start the crate training process over again. If your new dog is not yet ready for the crate, he should be contained in a safe room that is easy to clean. Chewable or breakable items as well as electrical cords should be out of reach. You may use a baby gate or keep the dog connected to you on a leash. Your supervision is critical and when the dog is loose in the house, never let him out of sight. Crate-trained dogs do not develop separation anxiety as a result of being crated. Separation anxiety is an emotional state intrinsic to the dog. Attempting to use the crate as a remedy for separation anxiety will not solve the problem. Separation anxiety problems can only be resolved with counter-conditioning and desensitization procedures. 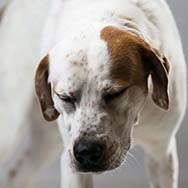 Should you suspect your dog has this condition, you should consult a professional animal-behavior specialist for help. 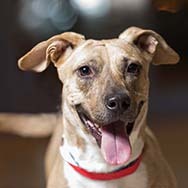 If your dog truly seems to panic while in the crate by excessively drooling or trying to chew through the crate,please contact the Wisconsin Humane Society’s Behavior Line at 414-431-6173 or email behavior@wihumane.org for assistance.